← Fixed work Task Type with limited Resource availability in MS PROJECT 2016! 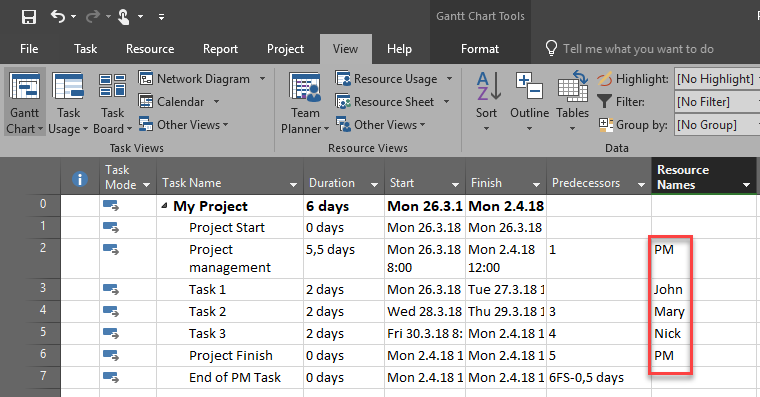 my blog reader has a question about Project management Task, and administrative work, and how to handle it in MS PROJECT 2016? First of all, I will advice not to use Project Start as a Task (Milestone), because I Project management Task should start at Project Start it will at that date without this milestone. As you can see we have Project management Task which is 5,5 days, and End of PM Task which is connected to the last Task of the Project, and it has 0,5 days of led time, just to finish at the end of the Project. I often hear complains about MS PROJECT in a way that you cannot create one single Task which will dynamically increase or decrease it’s Duration according to the Project start and end date. for example I want to have a Project management Task which duration will be same as it is Project duration. And yes, this is true. To answer to those question I will show no more screenshots, but I will explain this case briefly. If John is assigned to Task 1 with 100%, as he is in my example, and if I want to assign him to Project management task as well for 10% (this is just an example), and his maximum capacity is 100% he will become over allocated. And this is correct. Why? Because, if you exceed maximum capacity for resource this resource should be marked as over allocated, because IT IS OVERALLOCATED! As simple as that. On the other hand you can put maximum capacity for John 110%, and in that case John will not be over allocated. But be aware of this: John will never, ever be over allocated if it has to work, for example 110% on any single or multiple Tasks, no matter if those Task are “regular” or “PM”! To conclude, sometimes you r Resources will be and should be over allocated. Just another simple example. If you have meeting every single day, and this meeting should be 5 minutes per day, will you have a real, I mean REAL problem if this resource will be over allocated for 5 minutes? I don’t think so. This entry was posted in MS PROJECT 2016, PMI, PRoject Management and tagged Micorosft Project 2016, Micorosft Project 2016 - Resources, Micorosft Project 2016 - Schedule, Micorosft Project 2016 - Tasks. Bookmark the permalink. Is-it possible to define a fixed task (like Business analyst or PM) for the whole project duration? and the end date is automatically updated if the project is delayed?